There is one HUGE mistake that almost every photographer makes. More photographers have gone out of business, or suffered year after year needlessly because of this mistake. It's "Underestimating the Difficulty Of The Task of Marketing A Photography Studio." Most photographers think that "If I Build It, They Will Come." Wrong! Because of this mistake, their phone either hardly rings at all, or only rings with people who just care about a low price. Disaster! There's no doubt that marketing is one of the most frustrating, scary, uncertain parts of the photography business. What do you do? How do you do it? What works? Let's talk about it here. Marketing Secret #1: Accept the fact that now more than ever, the best marketer wins. It's always been like this, but now, it's even worse. Who cares how "good" your photography is, if no one knows you exist, and knows why they should call you, rather than any other photographer in the state? Let's face it right here and now. You didn't go into photography to be a marketer. I didn't either. But if you're not a really smart marketer, your studio will fail - regardless of how good your photography is. You'll burn yourself out working hard, trying to make a living, and eventually give up and quit. Sorry, but it's true. The best marketer wins. So whether you like it or not, you MUST become a savvy, intelligent marketer. How? Well, I'll tell you how NOT to become a great marketer - by being creative. By being original. By being inventive. You see, marketing does NOT have to be creative or original. It MUST be PERSUASIVE! That's all - just persuasive. And the best way to have marketing pieces that are persuasive, is to model your marketing after marketing pieces that have already been proven to work. That's what I did. 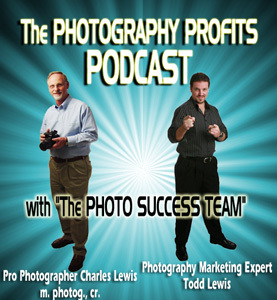 I studied marketing for over 25 years - but not photography marketing - I went outside the photography industry, and studied and discovered the best ways to market - and then I "Lewisized" it all into the photography industry. The bottom line: Don't try to be creative and do marketing that no one has ever done before - thinking that your creative marketing ideas will work. They may, but they probably will not. Take someone you respect, and (with their permission) copy their marketing - just be sure that their marketing worked! That's really important! Marketing Secret #2: Marketing is salesmanship in print. If you can't successfully sell to a person face to face, you're not going to be able to "sell" in your marketing either. And the result will be financial ruin. Have you ever tried some marketing or advertising that didn't work? The reason it didn't work is 9 times out of 10 going to be that you didn't know how to correctly "sell" it to your prospects. Thus, you were unable to "sell" it well enough to get them to pick up the phone and take action and call you. Marketing is NOT just letting people know you are there - that's just the beginning. You see, just "being there" isn't enough to get people to take action and call you, at least not in this day and age. It's takes a whole lot more than that. That's where "salesmanship in print" comes in. Let me give you a few examples. 1. People take action, and invest in photography, for emotional reasons, not logical reasons or price reasons. This means that if your marketing efforts are based solely on logical and price reasons to act now, you will usually fail. That's why you see so much emotional appeal in all my studio's marketing pieces. If you want to do more photography, it's critical that you put emotion in all your marketing. 2. People are constantly tuned in to the radio station, WIIFM - "What's In It For Me?" So if your marketing or advertising doesn't emotionally show them what's in it for them, you fail. It's vital that everything you say points directly to how the prospect can benefit by doing what you're asking her to do. That's why you see carefully written ads, brochures, and sales letters from my studio that clearly demonstrate how the prospect can emotionally benefit by doing what I'm asking her to do. 3. People buy from people they like. This means that if your marketing or advertising doesn't get them to like you, you fail. This is a very important, yet difficult aspect of marketing. First, how do you get people to read your marketing pieces? And then, how do you write your pieces in such a way that they begin to like you? For my studio, each and every marketing and advertising brochure, sales letter, lift card, web site, etc. is carefully constructed to make it easy for my target market to like me. 4. People like people who are like them. So if you don't show them how you are like them in some way, your marketing and advertising fails. This is one of the main reasons why so many marketing and advertising attempts just don't work. The creator of the ad, mailing piece, or what ever the media is, totally failed to get the prospect to like them. And here in lies one of the biggest mistakes in marketing! Marketing MUST be from a PERSON to a PERSON. People buy from PEOPLE - not from companies! All my advertising pieces and ads have been carefully crafted to be more personalized than you normally see in photography. Why? Because that's how, unless you have a HUGE marketing budget, you create effective advertising that works! 5. Rapport and Trust are the most important aspects of sales and marketing. If your marketing and advertising doesn't build rapport and trust, you fail. So how do you build rapport and trust in your marketing and advertising pieces and ads? One of the most effective ways is you back up everything you say with testimonials - and use the full name, city and state of each person. You will see the strong use of testimonials throughout all my marketing pieces, ads, and lift cards - because they are the backbone to effective marketing. 6. The fear of loss is greater than the desire for gain. This is extremely important for you to understand every minute you are writing and working on your marketing and advertising! Because your marketing must help them overcome this huge fear of loss, and get them to take the action you want them to take. Again, one of the most effective ways to do this is through your client testimonials. Be sure you use photographs of each of the people who are a testimonial. One of my RULES (which I try really hard in all my studio's marketing pieces to adhere to:) Never, ever use a photograph without a testimonial, or a testimonial without a photograph. 7. Selling (marketing) is finding out what people want and helping them to get it. It is not pressure, trickery, lying, or manipulating. So you must always be honest in your marketing and advertising. In selling, we can ask our prospect questions to find out what they want. But how do you find out what they want with marketing? You don't. You have to have years and years of working with clients, understanding what they want, and then transfer that knowledge into all your marketing pieces. This is one of the most important, and yet difficult things to do successfully - and another reason you want to copy (with permission) the marketing done by someone you respect and trust. In my studio's marketing pieces, it's obvious that I know EXACTLY what they want, and I can get it for them. That's one of the many reasons my marketing has been so successful - both in good times, and in recessions! Marketing Secret #3: Be sure to select a "target market." **What's the gender of my target market who will want the above product? **What's the age range of my target market? **What's the family makeup, income, location, and any other "Demographics" and "Psychographics" that will help me reach the right people? Then specifically go after that person you described above. Marketing Secret #4: Allow enough time every week for marketing. Marketing is one of the 4 Major responsibilities you have. It requires your attention and time. If you don't specifically schedule the time, your marketing will end up in constant "crisis" with you always being late, and putting out "fires." This does not lead to effective , productive marketing decisions. You MUST schedule at least one full day, every week, for your marketing. And if you have to write and produce all your own marketing from scratch, (which I definitely don't recommend!) you need to schedule two full days every week. I know this seems like a lot of time, but unless you have proven marketing and advertising pieces that have already been written, that's what it takes to successfully market your studio to a level that will make it enormously profitable. Marketing Secret #5: Beware of thinking that if you write it, people will read it. This is one of the most common mistakes. Just because we write something, whether it's a sales letter for direct marketing, or an ad for a publication, or even a yellow pages ad, just because we write it, does NOT mean our target market will read it. You must specifically write your marketing so it is aimed directly at the target prospect you are after. Headline - never, ever write anything without a headline. The headline is one of the most important parts of your marketing pieces, mailers, ads, etc. The headline usually is most effective if it promises a clear benefit to the reader. Subhead - Most successful marketing pieces have a subhead, beneath the headline, which further talks in terms of benefits to the reader. First paragraph - This either "grabs" the reader, and keeps her reading, or it fails to do this , and she stops reading right there. So be very careful what your first few sentences say. Double readership path - Always write your ads, brochures, lift cards, and sales letters for two types of people - those who read every word - and those who scan for the key points. - That's why all my pieces have additional subheads throughout. Talk about them, - and how they can benefit, do not talk about you or your company except where it is absolutely necessary. The above pointers are the basis of each of my studio's marketing pieces, brochures, lift cards and ads. Marketing Secret #6. Never take marketing advice from someone who is not where you want to be. So many photographers follow other photographers, who don't really understand marketing themselves, rather than being very careful who they take advice from. The great Donald Jack taught me this. He said, "Never take advice from someone who isn't where you want to be." Well, that goes for marketing advice, too! Fully 99% of all of us photographers are not marketers. It's not what we went into business for. We love photography - not marketing. So one of the most dangerous things you can do as a photographer, is to listen to other photographers about marketing - unless you KNOW they are truly an "expert" at it. As I mentioned above, I learned my marketing by studying with other professionals, in other fields, and then modifying everything I learned to work in photography. It took years and years of studying marketing, when all I wanted to do was take photographs! It was painful, slow, expensive, and very frustrating - but it paid off BIG TIME! Marketing Secret #7: Don't fall into the trap of believing that giving away photos will bring in good clients. My way isn't the "only" way, but I am strongly opposed to giving away any photography at all. It seriously cheapens your image and the value of your products and services in the prospect's eyes. There are other ways to get people to act, and other items you can give away, other than your photography. For example, you can occasionally have a special offer, or a sale. Occasionally. But not too often. You can include "bonus gifts" (but NOT photographs!) - like frames, easels, special folios to hold photos, etc. Be sure all your offers have a DEADLINE. But don't, I repeat, don't give away your photographs themselves - it totally cheapens your product. Marketing Secret #8: Realize that marketing is like a table, and must have many "legs." If you build a table with only two or three legs, and you lose one of the legs, what happens? Your table falls over and is worthless. Well, marketing is the same thing. You want to have four, five, six, or ten different "legs" (different marketing methods) so that if you lose a couple, your "table" is still strong and standing. For example, here's some of the "legs" of the marketing "table:"
General Exhibits - all over the community. - at least 12 of them - changed every 30 to 45 days. Specialty Exhibits - Symphony, Ballet, United Way, etc. 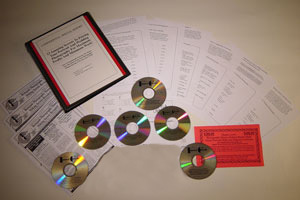 Direct Mail To Past Clients - The "VIP" program - your best future clients are your current and past clients. Innovative Web Site - designed to GET LEADS - not look pretty - uses all the secrets of direct marketing. Speaking At Women's Service Clubs - where you take some samples, pass out business cards and "lift cards." Direct Mail To Prospective New Clients - carefully crafted using the "secrets" discussed in this newsletter. Radio Trade Outs - ads in return for photographic services. Joint Ventures With Other Businesses - where both you and the other business benefit. Lead Generation Lift Cards and Postcards - carefully crafted to produce leads. Recorded Hotlines - carefully crafted to capture the name and address of the prospect, and then they are sent a sequence of mailings designed to get them to call you. Yellow Pages Ads - carefully crafted to not look like any other ads - designed with a powerful headline - definitely NOT what I call the typical, "Name, Rank and Serial Number" ad. There's many more "legs" to a successful marketing program, but you get the idea. Marketing Secret# 9: Beware - do NOT look around, see what every other photographer is doing in your area, and then just go ahead and do that - big mistake. This is such a HUGE problem in photography. Everyone is following everyone else. There is no leader. It's the blind following the blind. But, the end result of all this is that it makes it MUCH easier for those of us who spend a huge amount of time studying, testing, and discovering the best ways to market (by going outside of the photography industry) to be really successful! Frankly, that's why my marketing has worked so amazingly well. Those of you who own the "Raid My Vault" system can easily see how my marketing is not at all like most other photographer's marketing - because I learned it from professional marketers, who are NOT photographers, and then put years into modifying everything to work for photography! Use these 9 major techniques to begin crafting your strategic marketing plan. A "Strategic Marketing Plan" is the whole "table" with all the "legs" in place. We'll talk in great detail next month about this! Then you carefully set a total budget for the next 12 months, and then the challenge is to accomplish all the "legs" of the "table" while remaining within the total marketing budget you have set. Go for it - you can do this, and it will result in your studio being one of the leading studios in your area - with lots and lots of profit! And remember, if it were easy, then everybody would do this. Your marketing is vital to your success - and yes, it take time and effort. But it's worth it!